Some people are lucky enough to walk through life without so much as a pimple or a dry patch on their face (I've never met any of them but apparently they do exist!). Some people get the odd spot or sensitive area but generally have a pretty even complexion. Others have somewhat of a chaotic time trying to balance their skin's sensitivities - eczema, adult acne, hypersensitivity, redness and menopause-related pigmentation being some of the skin issues that make some people feel like their face is on a roller coaster of epidermis mayhem. What is needed is a treatment designed to focus on helping the skin naturally strengthen its own rebalancing functions. Dr.Hauschka have created a series of 28 day spray on Intensive Treatments, specifically developed to support different skin conditions. They have used natural saline from a therapeutic spa, rhythmitised herbal extracts and specially prepared precious metals and gemstones to create a treatment for any skin condition. 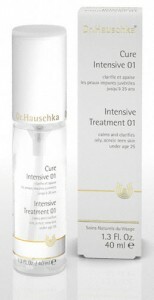 Intensive Treatment 01 calms and clarifies oily, acne teenage skin, Intensive Treatment 02 calms and clarifies oily, acne adult skin age 25+, Intensive Treatment 03 calms and strengthens hypersensitive skin (for blotchy, red, sensitive skin), Intensive Treatment 04 firms and vitalises mature skin (smoothes and prevents dryness lines), and Intensive Treatment 05 balances and fortifies the skin during menopause (reduces redness, pigmentation, corrects decreasing vitality of the skin). You use these treatments in place of your toner in the morning and evening. Cleanse as per usual and add day cream after the treatment. In the evening, according to Dr.Hauschka's no night cream principles there is no need to apply a cream after the treatment so you can leave it, independently, to do it's best work whilst you sleep dreams of clear, calm, glowing skin.